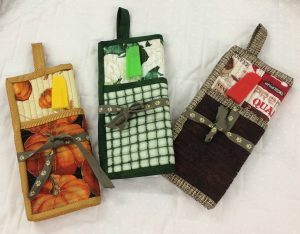 There’s still time to sign up for the Potholder Class & Christmas Luncheon. The fundraising event will be held at Spooner Market & Grill on Thursday, November 30th from 4-7pm. It’s a great event with lots of socializing and fun. Those of us that have made potholders continue on with a holiday luncheon at PineBrook Farms on Tuesday, December 5th where we’re treated to great Holiday Atmosphere and awesome food. This year we’ll be having a fondue lunch! We’ll play a little game with prizes and drawings. It’s a fun event to kick off the holiday season. If you can’t be part of the event, but would like the pattern for the potholder, let me know. Cost is $10 with all proceeds donated to shelter. Enjoy the beautiful week we have ahead of us. Stop in when you can.